Every once in a while a movie will come along that claims to be Christian yet distinctly isn’t. One such movie is The Shack by William P Young. Contrary to many well meaning Christians who say it’s “just a story”, the book claims to be religious on it’s back cover and even the author himself says it’s “theology”. That alone is enough to take a closer look at what it teaches and see if it qualifies as Christian “theology”. I have personally read the book and was amazed at how wrong it portrayed Christianity. This book contains numerous distortions and heretical teachings, and has the potential to mislead many people because of it’s emotional rhetoric. This is why we have to Scrap the Shack! 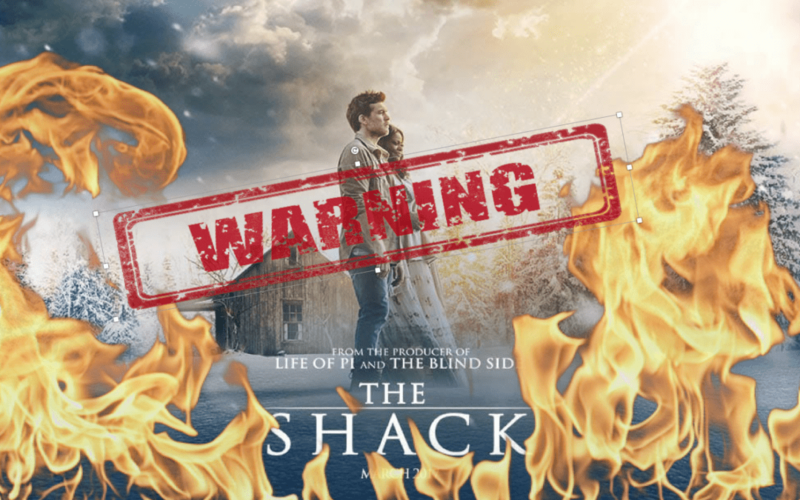 There have been whole books written (Burning Down the Shack) about The Shack because the distortion is so bad. I’m not going to review the movie because I’m not even going to see the movie and support films like this. Many good teachers have reviewed the book already and detailed its many problems. This is why I made an easy list for your reference below. This is not an extensive list of critiques but just a short compilation of ones from several Christian teachers I trust. Let’s practice discernment in a day and age where it is desperately needed! Watch the movie, then decry it if you will. Otherwise you have no credibility regarding the film. I know nothing of the story of the shack, but believe in what you do for Christian apologetics. I read the book, and the movie is based on that – in fact I said that in the blog. My goal is to warn people and make sure they know what they are getting into when seeing the movie. Most people think this is a Christian move when it is nothing of the sort. Thanks for responding and the encouragement.